With the holidays quickly approaching, motorists will take to the road for their Christmas shopping and visiting with family. Hamilton County EMS wants to remind motorists to be vigilant to EMS personnel working crashes on the streets of Chattanooga/Hamilton County area. Motorists who approach an emergency scene on the roadway, don’t know how to react or what to do. This confusion can be deadly for EMS personnel and first responders, vehicle crash victims, and other motorists approaching the scene, said officials. Hamilton County EMS shares tips for what to do when approaching an emergency scene on the roadways. If at all possible, avoid the area and take an alternate route. Do not make an illegal turn to avoid the incident, but instead plan a different route when you hear there is an issue. Slow down as you approach and pass an incident. Remain alert for unexpected occurrences, as this is a different situation than normal roadway driving. Move over any time you approach a stopped emergency vehicle. Move your vehicle over a lane away from the incident, as long as it is safe to do so. This gives EMS personnel and first responders room to work on the incident. Remember, this is the law in Tennessee. If no responders are yet on the scene and you have a hands-free cell phone, call 9-1-1 to report the incident. Note the location by mile marker, address, and/or landmark so you can report it accurately. Look for and obey all temporary traffic control signs and direction from first responders, including lane closures. 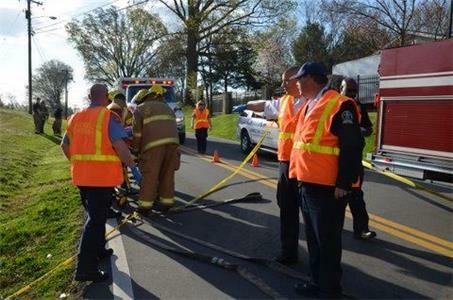 Temporary traffic control creates a safe work area for EMS personnel and first responders to treat victims on the scene. Never attempt to go around an emergency scene on the shoulder, drive through it, or turn around to avoid it or the traffic queue. These actions put you, other motorists, and EMS personnel/ first responders at risk of death and injuries. Do not take photos or video of the incident as you pass it and do not post on social media. This distracts you from driving, which may cause an accident. It is also disrespectful to the victims and their families, who are going through a traumatic experience. There have been situations where families of victims have found out their loved ones were injured or deceased from social media posts, rather than through an official notification from emergency services, who can provide needed support during the notification. Don’t put a family through the trauma of finding that out in a public forum. Remain alert, even if you have to sit in traffic. Now is not the time to let your attention wander or use your cell phone. Unexpected events can happen at emergency incidents and you must be alert so you can react. Awareness is the key to safety at accidents scenes. Knowing hazards and how to work around them will ensure the safety of everyone especially during this holiday season, said officials.